Wondering what’s been happening in the Vienna & Oakton real estate markets over the past week? Well . . .
Labor Day has come & gone. The kids have gone back to school. “What I Did This Summer” essays are being written. So we think this is the perfect time to look back over the Northern VA real estate market and do a year-over-year comparison for listings, sales & prices from January through August. Some Housing Markets Are Tighter Than Vienna's! Talking about real estate is like talking about the weather. . .
You work hard all year. You plan ahead for that great vacation. You dream of walking down onto the beach. Weather all over the world is GORGEOUS. You can’t wait to stick your toes in the sand, soak up the sun and sip on a fruity umbrella drink. You pack your bags, head to the airport. Hours later, you arrive and see . . . that it’s pouring at the beach. And the forecast for the entire week is 100% rain. At that point, you don’t care much about the weather in Rio or Reston or Fairfax or Fairbanks. Right? It only matters if it’s raining where you are! The same thing is true in real estate. Markets around the country can be as different as night & day. Sell Now or Wait Til September? This is a question we have recently been asked a lot. And this year’s answer is likely different than the answer we have given in most years past. Conventional thought was that August was a slow real estate month, families were on vacation and if you were thinking of selling, it might be better to wait until September when kids are back in school and more buyers have time to look at homes. The July 4th holiday means we are halfway through the year and it’s time for our Vienna real estate mid-year housing update. So how is the Vienna real estate market faring? 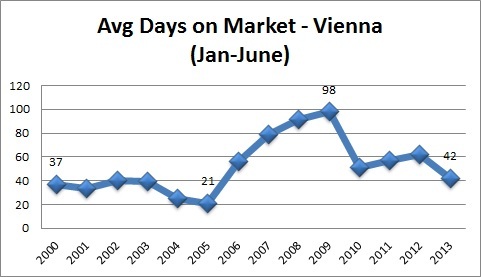 Instead of updating you on what has happened in the past week like we usually do, let’s pause and take a look back to the year 2000 and see where Vienna stands in terms of number of home sales, average selling price and average days on market. The full charts on our Northern VA real estate blog show a year-over-year comparison for January through June for each year from 2000 through 2013. What are the highlights? If you’re thinking of buying or selling a home, you’re probably wondering whether it’s a Buyer’s Market or a Seller’s Market. .You may even already know the answer – or at least you think you do! Local headlines (and even our Northern VA real estate blog!) are proclaiming “Seller’s Market”, “Homes Flying Off The Shelves”, “Multiple Contracts”, “Two Months of Housing Supply“. So let’s break it down and see what’s really happening!